Freezing is an excellent preservation method as it maintains all the original flavors as well as the characteristically fleshy and fatty texture of mushrooms. Just store in the freezer until you need them, and simply slice finely or chop, quickly cook in a little oil or butter, and throw into sauces, casseroles, soups, and stuffings. Whole Frozen Mushrooms in Bag (France). Calibrated, trimmed and cleaned for optimum yield, these mushrooms are flash-frozen to preserve their fragile texture. A unique and flavorful assortment of the most delightful mushrooms of the French forests are assembled here in this 1lb bag of frozen forest mushrooms. Adds wonderful flavor to sauces with meat, fish and poultry. Also good with pasta sauce, over toast, and with cream. Ingredients: Boletus Luteus, Pleurotus Ostreatus, Auricula Judae, Boletus Edulis. 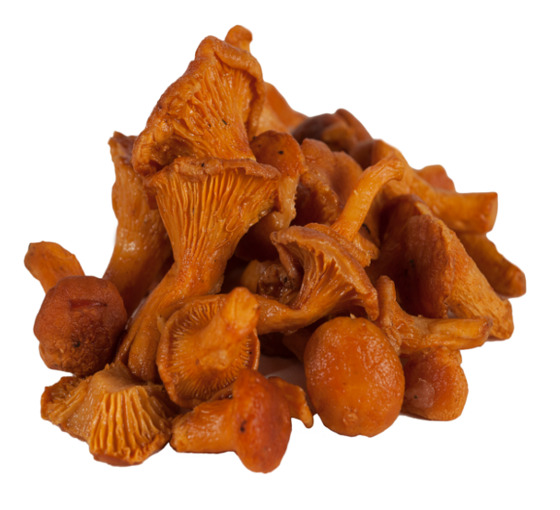 Delicate, fragile and beautiful, Chanterelles are spectacularly fruity and winy, with lovely hints of apricot.